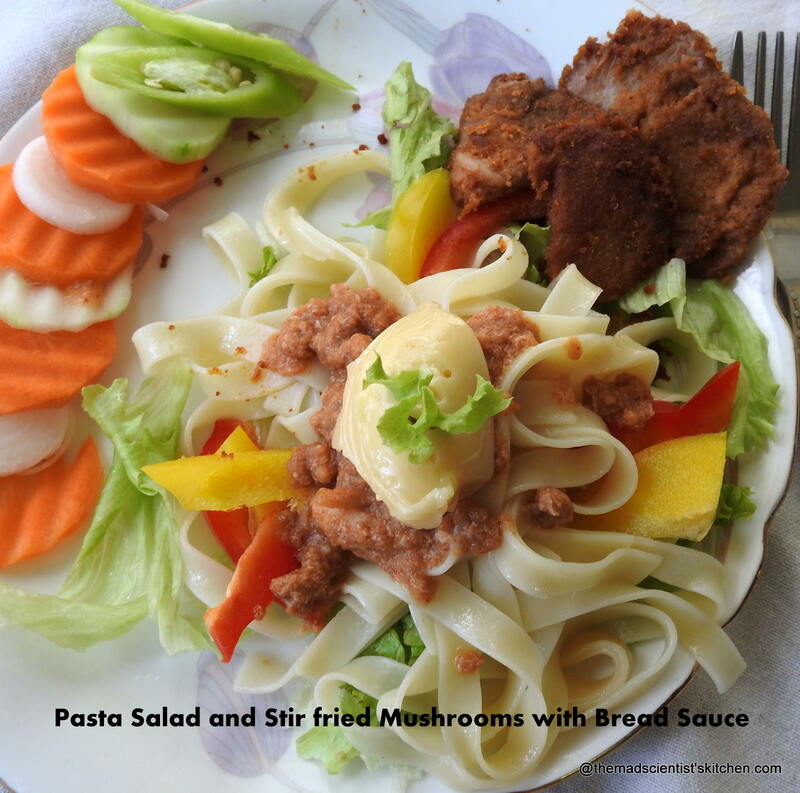 Celebrate Easter with this delicious pasta salad and stir fried mushrooms with bread sauce which your vegetarian friends will enjoy. By the way, I do not think there is any sauce called bread sauce. It’s just what I told the girls when I served them. They accepted! Actually, the mushrooms are shallow fried but since I had announced stir fry I am going with it. Why just the vegetarians I think it scores over the non-vegetarian food too! If the vegetarian does not eat mushrooms you get more mushrooms of course but still, the pasta salad tastes great! Easter celebrations are to celebrate the resurrection of Jesus Christ from dead! It’s the holiest day for Christians around the world. This day is also called Pascha.On Easter Sunday, yes it’s always a Sunday, there is a special mass held in churches. People wear new clothes and decorate eggs. Easter also marks the end of Lent when meat is avoided by most Christians. Easter is traditionally celebrated with ham, chicken and lamb, fish. But this leaves the host and the vegetarian guests with little choice. So this is an effort to make both of them comfortable. Since I loved the salad so much you have to suffer my pictures. For Easter, the other dishes you can try are Flaounes (Cypriot Savoury Easter Cheese Pies), Egg-less Slovak Paska Bread – Easter Special, Baked Apples, Fruit Salad, Yogurt Parfait. 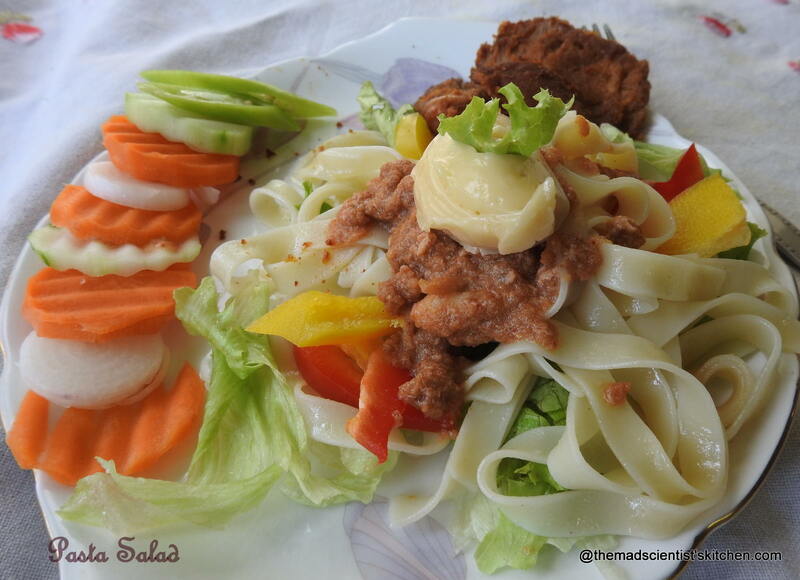 Celebrate Easter with this delicious pasta salad and stir fried mushrooms with bread sauce. In a bowl mix the marinade ingredient and add the mushrooms. Set aside to marinate for 30 minutes. Meanwhile in a deep vessel add the water and the garlic and salt and boil the pasta as per the instructions on the packet. Once the pasta is boiled strain the pasta and reserve the water. Apply the oil to the pasta and set aside to cool in a wide bowl. Wash and dry the lettuce leaves. Tear a few leaves and add to the pasta, add the carrots and cucumber, capsicum. Add the half the mayonnaise, pepper and salt to taste mix well. By now the mushrooms will have marinated.Beat the egg with salt and pepper. Dip the mushroom in the egg and then dredge in the bread crumbs. Transfer the mushrooms to a heated non-stick pan. Fry till the mushroom is done say about 4-5 minutes on both sides. Set aside. Lay a bed of lettuce leaves on the plate. Add the pasta salad. Top it with bread sauce (see note 2) and top with mayonnaise with the left over. Serve. To fry the mushrooms you can use a thin slurry of cornflour in place of the egg. 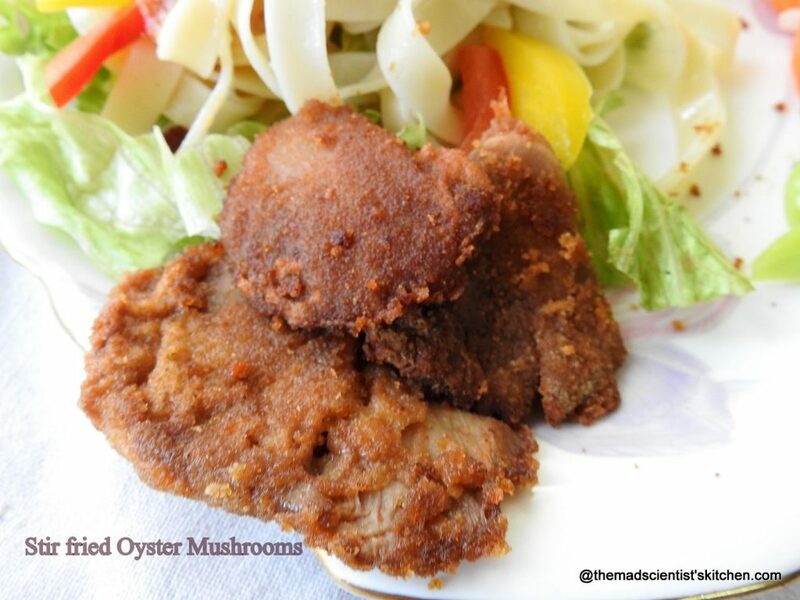 After I finished frying the mushrooms I had about 2-3 tablespoons of egg and ½ cup of bread crumbs. I thought the salad was a bit dry. In the non-stick pan, I added 2 cups of the reserved water when it came to a boil added the egg and the bread crumbs. I let it thicken then added to the pasta salad. This is for Srivalli’s Kid’s Delight event, guest hosted by Pavani, themed on Easter Treats. The salad looks very appealing. Thats a fabulous salad and those mushrooms are so tempting. Yummy looking pasta salad and the bread sauce sounds interesting. Bread sauce is interesting! 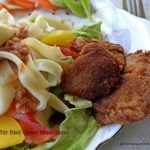 Wonderful pasta salad and fried mushrooms is a nice addition to the salad. The platter looks so inviting….your girls are lucky!